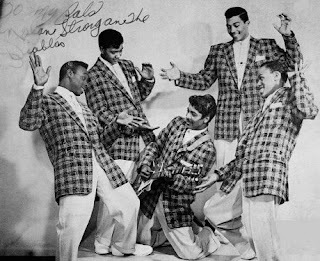 Nolan Strong & The Diablos were a Detroit based R&B and doo-wop vocal group best known for its hit songs "The Wind" and "Mind Over Matter." The group recorded for Fortune Records, a small label in Detroit starting 1954 and did so through the early '70s. Nolan Strong, the lead vocalist, had an etherially high, strong tenor voice. Strong's smooth tenor, was influenced mainly by Clyde McPhatter and in turn, Strong influenced a young Smokey Robinson. The group formed at Central High School in Detroit in 1950 and originally consisted of Nolan Strong (lead tenor), Juan Guitierrez (tenor), Willie Hunter (baritone), Quentin Eubanks (bass), and Bob "Chico" Edwards (guitar). Nolan Strong named the group the Diablos after a book he had read in high school called "El Nino Diablo." In 1954 The Diablos began recording with Fortune Records, releasing a handful of 45 rpm records. By late 1956, changes were made to the Diablos line-up. Scott decided to leave the group about this time to join Hank Ballard & the Midnighters — and again the Diablos were in need of a bass. Enter Jay Johnson, who was introduced to Strong through fellow Fortune artist Andre Williams. Nolan's career tapered off after 1965; Fortune Records' having him locked into an unprofitable contract is a rumored reason for his lack of recordings in the late '60s and '70s. Jimmy Strong passed away January 29, 1970, at age 34. His brother Nolan joined him on February 21, 1977, at age 43. Hunter, Edwards, and Eubanks are also deceased. The Diablos were inducted into the United In Group Harmony Hall of Fame in 2003. In March 2008 the group was inducted into the Doo-Wop Hall of Fame of America. Today, original Diablo and Fortune Records recording artist Jay Johnson performs with a new group under the name "Nolan Strong’s Diablos" - singing all the old hits. "The Way You Dog Me Around"
"I Want To Be Your Happiness"
"Someday You'll Want Me To Want You"